Finally, a solution to restore the out of phase reflections from the wall behind the speakers in time and phase is invented. The PRAP when added to a system can render a level of musical realism that a standard stereo system no matter the cost can deliver. No other room treatment can claim to do this. The PRAP is a major improvement in the reproduction of recorded music. In a recording venue, the back wall, the front wall, the side walls, the floor and the ceiling reflect sound waves that are recorded along with the performance. It is well known that the reproduction of a recorded event thru a stereo system in a home listening environment is compromised by the physical characteristics of the room. The room acoustic in effect competes with the recorded ambiance. There has been over the years remarkable progress made in room treatment. One area however has remained unsolved, the negative acoustical impact of the wall behind the speakers. The Dupuy Acoustique PRAP is the solution, a unique remedy to a nagging problem. Music, unless recorded in an anechoic chamber, will contain all the reflecting properties of the recording venue and when played back, the listening room will add its own character and limitations in the form of standing waves, modes, diffractions and indirect reflections. 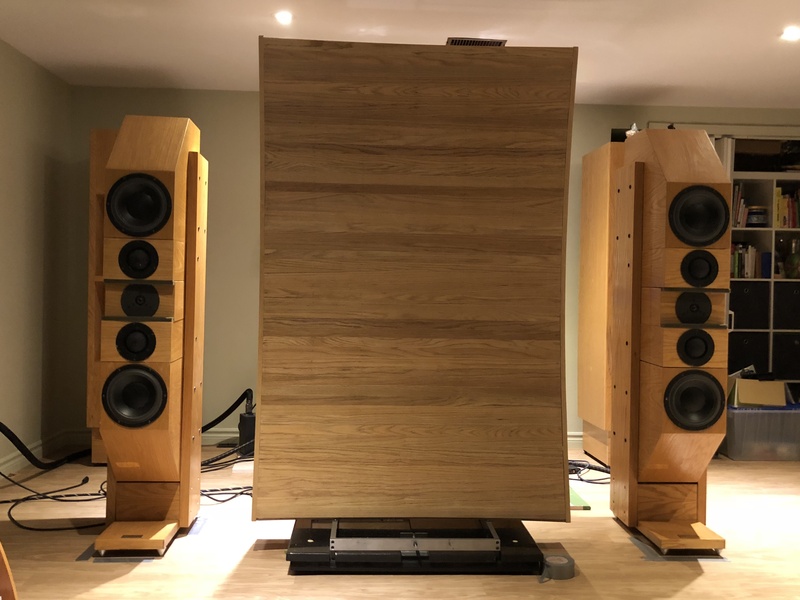 Fortunately, means are now available to partially mitigate these conditions with the use of absorbers, diffusers, bass traps and more recently DSP. However, the wall behind the speakers reflects differently and requires a special and unique treatment. The Phase Restoration Acoustical Panel (PRAP) is the remedy. Efforts to minimize the deleterious effects of the reflections from the wall behind the speakers by placing diffusers or absorbers on the wall or even moving the speakers toward the middle of the room away from the wall have only produced very limited benefits. The time delay and out of phase reflections do not disappear, they are only minimized. During a recording session, the original reflections from the wall behind the performers are present in the recording and when reproduced, these recorded reflections will conflict with the reflections from the wall behind the speakers in the listening room; this causes time smears and phase anomalies. The result is a lack of focus, a false sense of depth, a weak center fill, an unstable image, unnatural dimensionality, grains and noises, all caused by the out of phase reflections reaching our ears. Unfortunately, we have ignored these weaknesses, taking them for granted as normal and intrinsic to stereo presentation. However, the fact is that we can come very close to reproducing quite faithfully the recorded music. The Dupuy Acoustique PRAP drastically and dramatically changes the listening experience. The reason is that the PRAP addresses the phase issues when properly aligned with the acoustic center of the speakers. 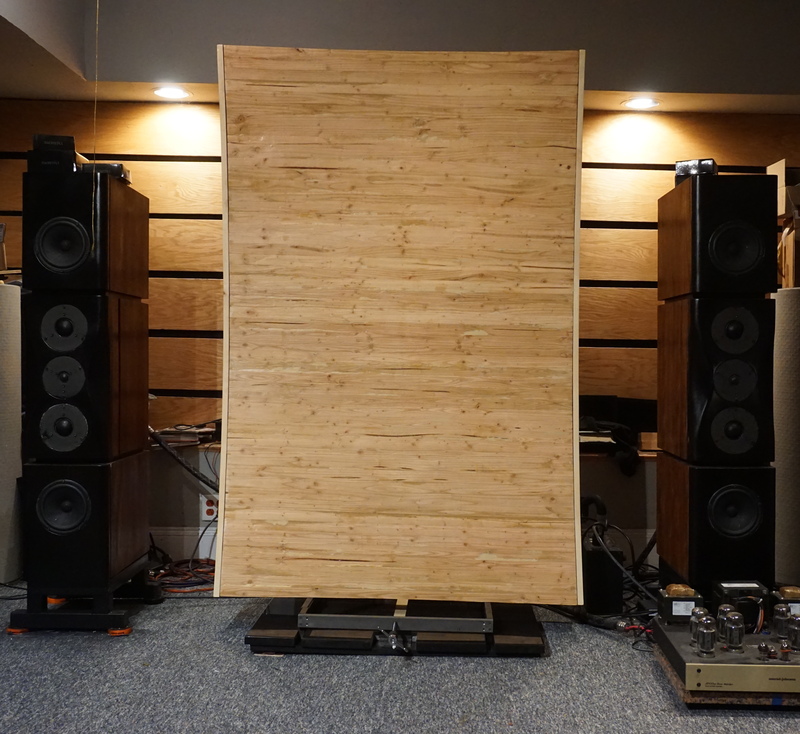 It is an acoustical panel designed to create a partial back wall for the listening room whose purpose is to correct the phase anomalies mentioned above. The PRAP to work must be placed in the middle of the speakers and aligned with the acoustic center of the speakers. The PRAP is a temporal device and does not modify the frequency response nor the dispersion pattern of the speakers. The PRAP is a precision device, unlike absorber and diffuser panels, it requires exact placement with tolerance of 1/32 inch or better. Once correct placement is achieved, The PRAP transforms the listening experience by bringing the listener closer to the live recorded event. 1.The most apparent sonic contribution of the PRAP in a stereo system.is the localization of every voice and instrument on the sound stage. 3.The proverbial sweet spot is substantially enlarged. The listener can move but the voices and instruments remain solidly in place like in a concert hall. 5.Voices and Instruments carry the weight and timbre of real live event; in addition, human scale is remarkably well maintained and projected. 6.Center fill is solid and palpable, producing a remarkable, frightening resemblance to a real lived event. 7.More details as well as micro dynamics are revealed with the panel in place. 8.Transients sound exceptionally clean and natural. 9.Notes decay are faithfully reproduced. 10.The PRAP physical presence is visually strong and imposing but it is acoustically transparent, does not add any color or distortion to the sound. 11.The PRAP produces a blacker background due to a definite elimination of noise and grains created by out of phase reflections. The panel is made of a reflective compound curved surface. It is supported by a base made of granite. To achieve perfect alignment with the acoustic center of the speakers, the base contains a manually operated mechanical device designed to incrementally adjust the position of the panel. The proper installation of the PRAP is critical for optimum performance. The panel must be centered in the space between the speakers. Initial installation requires that the speaker drivers be at the same distance from the listener (radius) as the center of the panel forming an arc from the listening position. Now the delicate operation to align the acoustic center of the speakers with the PRAP entails critical listening. The mechanical device located at the base will move the panel back or front 1/32” or 1mm at a time. Incremental adjustments and using familiar recordings will help achieve the correct alignment. Experimentation is necessary because the location of the acoustic center of the speakers is not given as specifications by the manufacturers. More detailed instructions and illustrations will be provided to assist the purchaser.